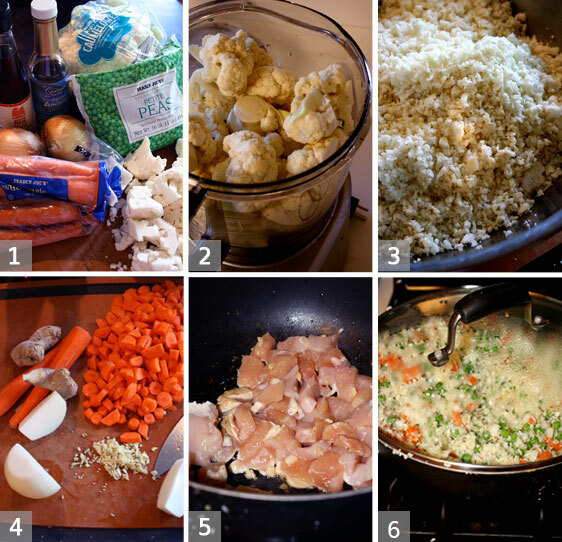 Cauliflower Rice is very easy! You can pulse it yourself and make rice like I did above OR you can now buy cauliflower rice from Costco it's organic AND you get two bags for $3-4. It's amazing. Get some! Chop up and stir fry whatever veggies you like. I ususally do carrots, but I'll always throw whatever I have in there---bell peppers, frozen peas, broccoli, pineapple. Yum. I like a good chunk of chopped garlic and ginger with a dash or two or three of soy sauce (liquid aminos or tamari). Easy peasy!